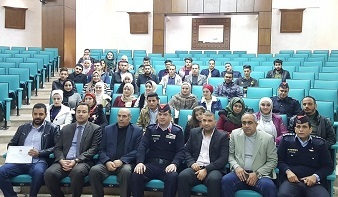 A representative of the Police Director of Al-Balqa Governorate, Brigadier General Amjad Al-Shamayleh and the Colonel Marwan Al-Daroubi patronized the graduation ceremony of the First “Police Friends” Course for AAU students registered in the academic year 2018-2019. The ceremony was attended by the AAU Vice President, Prof. Sulaiman Al-Lawzi, and the Dean of Student Affairs, Dr Mustafa Al-Attiyat. 50 female and male students participated in this course which was held in the period between 2 to 5/12/ 2018. The Course included several axes, the most prominent of which are: the duties of the Public Security, drugs, extreme thinking and cybercrimes. In his speech, the Assistant Director of Al- Balqa Police emphasized the importance of holding such courses, which aim to provide students with new information and concepts that help them in their daily and practical life and make them companions of the public security men. Such courses also contribute to deepening the concept of community policing through communicating with the local community, which strengthens the relation between citizens and public security men. In his brief speech, the Vice President, Dr. Al-Lawzi praised the efforts of the Directorate of Public Security and stressed the need to hold such courses for the benefit of participants and community members. After that, he presented the University honorary shield to Colonel Marwan Al-Daroubi and handed the certificates to the participating students. At the end of the ceremony, the AAU Deanship of Student Affairs announced the launch of the Police Friends Club at the University.